When it comes to hot peppers, there’s one thing most pepper fans can agree on – the Scoville Scale for Peppers. What is the Scoville Scale? It is the way to tell how hot a pepper is going to be. 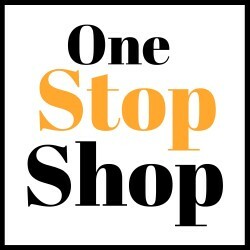 I like to cook with hot peppers, smoked peppers, hot sauces and seasonings. I do want to know though how hot it is going to be in the end. For me there is nothing worse than a burning heat where you can’t actually enjoy the other flavors of the dish. Having some pepper knowledge really helps. Invented by American Pharmacist Wilbur Scoville in 1912, it was originally called the Scoville organoleptic test before becoming standardized as the Scoville Scale. 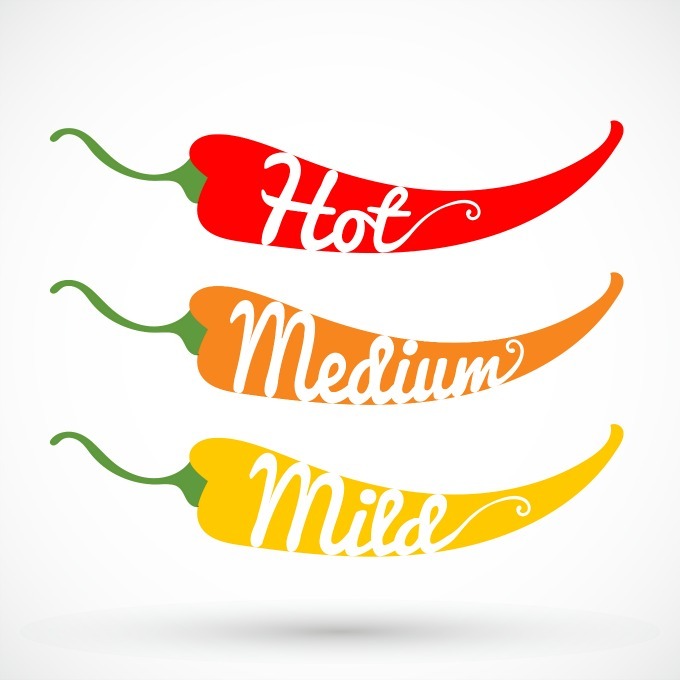 The Scoville Scale measures the capsaicin concentration, or what makes the peppers taste hot. Interestingly the original Scoville test involved feeding peppers to volunteers! Scientists mixed the ground peppers with sugar water – and measured how many additions of sugar water the pepper needed before it no longer tasted hot to the tasters. That means that jalapeño peppers, with a Scoville scale rating of 5000 would have needed 5000 additions of sugar water before they stopped tasting hot to the volunteers. Thanks to modern science, we no longer need people to volunteer to taste hot peppers – we can use high-performance liquid chromatography to measure the amount of capsaicin in a pepper or other substance. WHAT PEPPER IS THE HOTTEST? The hottest pepper ever measured was a Carolina Reaper pepper. It clocks in between an amazing one million five-hundred thousand and two million Scoville Heat Units (SHUs). It has the Guinness World Record for the hottest pepper in the world. Only a few people have ever dared to try it (with good reason I think!) and they compare the taste to eating molten lava. I’m going to take their word for it and you probably should too if you value your taste buds. The average sweet pepper has between 100 and 300 SHUs , Frank’s Red Hot sauce has about 450 SHUs, and Sriracha has anywhere between 1200-2200 SHUs (depending on the brand), and Tabasco sauce has 3500 SHUs. All considerably below the jalapeño pepper which most hot pepper aficionados consider to be relatively mild. 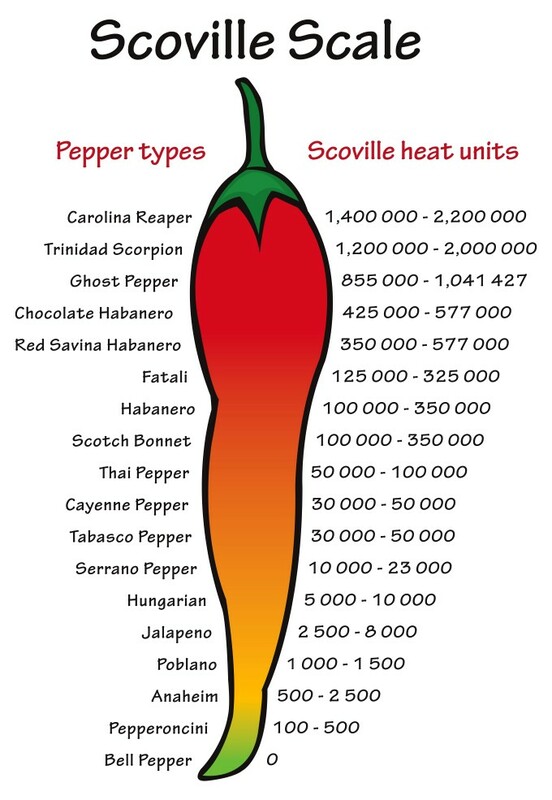 The following table lists some common peppers from around the world and their approximate Scoville Heat Units. The reason there’s a range for some of the peppers is that peppers can vary in their heat. If the same type of pepper is grown in two different places, there can be a difference in how hot those seemingly identical peppers are. 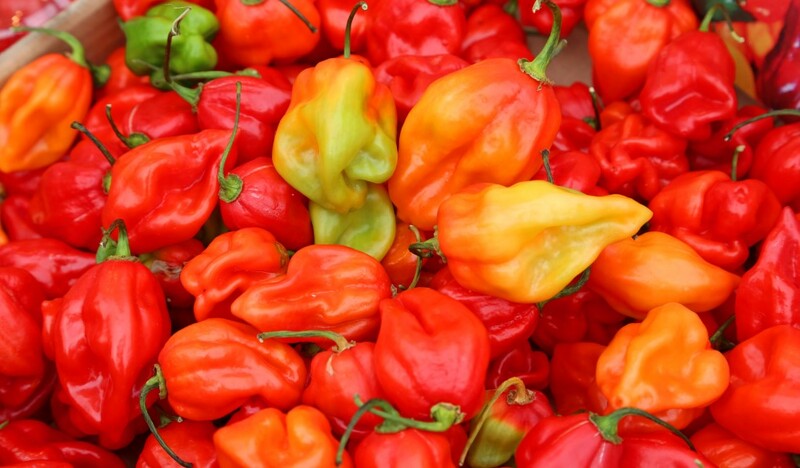 Factors such as soil acidity, sunlight, and what plants are nearby all affect the heat a pepper produces. There’s also random genetic differences in peppers – just as no two snowflakes are alike, no two peppers have identical amounts of spice. The Carolina Reaper is a great example of a pepper that has been cross bred to create an even hotter pepper. It’s not a variety that spontaneously appears in nature. Why create something that can best be described as eating “molten lava”? Good question. People who eat super-hot peppers claim they get a pleasurable sensation after eating them – most likely because the body releases endorphins (feel-good chemicals) as a response to the pain of eating something so hot. This is also why chili peppers and capsaicin are popular ingredients in over the counter pain creams. When applied to the skin, the heat of the chili can bring on pain relief. So even if there are only a few people who will ever taste these ultra-hot peppers, many more can benefit from them. What’s the hottest pepper you’ve ever tried? Let me know in the comments. You are welcome Carmen. I am also of Finnish ancestry on my mother’s side. This is super neat to see and think about! I am probably a mild person but I know my husband loves to be daring with hotter flavored peppers. I love hot food. I remember the first time I had tried some Ghost Pepper wings, I lost my vision for a few seconds! They were hot. I am not sure I can go much hotter than that. Down here in Texas, the hotter the better is often a phrase I hear. I cannot take peppers at all, but my husband and son love what they have called the “pain olympics.” They have gone as far as ghost pepper salsa, but it was almost too hot for either of them. My husband is a huge fan of super spicy food, so I’m actually familiar with the Scoville Scale. The heat from a jalapeno is more than enough for me! I never knew there were so many types of peppers. I like jalapeño peppers in a dip but that’s about it. Thank you for this interesting information. I am sending this post to my husband as he loves spicy a lot and is always looking for more spicy peppers! Wow! This is really interesting! I had no idea there were a lot of pepper types! Thanks for this! WOW! This was really interesting. I can’t imagine why you would eat a pepper at the top of this scale, but l can see how it can be helpful! I love spicy food but usually the milder peppers and spices. Everything tastes better with spice! This is so cool! I like spicy dishes but just on the scale of jalapeno. ha! That’s just right for my taste buds. Oddly enough as I have gotten older I am more interested in hotter peppers. I like heat and flavor combined.